What if there was a place by the beach, with rides and where everything is fried? I am sure it would be one of the most magical places on Earth. Enter Santa Cruz Beach Boardwalk. Perhaps it is a result of growing up 45 minutes away from the Disney World, but every now and then I get a real hankering for the touristy and the tacky. So, on a recent weekend, I went out on a quest to visit the illustrious Santa Cruz Beach Boardwalk to see if I could capture some of the excitement of yesteryear. As someone who grew up by the beach (a lovely little oasis called Cocoa Beach, Fla.) I think I was destined to love Santa Cruz and all its offerings. Driving into the city, I could immediately feel the sun beating down on my skin, and was greeted by a plethora of Mexican restaurants and surf shops – staples of any surf town. 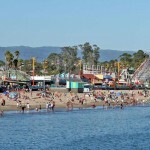 Santa Cruz is 70 miles south of San Francisco, and has just 59,946 residents (source: Census 2010). Its beachy vibe and killer waves has long made it a contender of the title the “Real Surf City USA” (it officially lost the title in California courts in 2008 to Huntington Beach). This laidback lifestyle gives way to the liberalism that is ever present in the city, which is probably in small part due to the presence of state school University of California, Santa Cruz. The Boardwalk is an institution in its own right, and has a history that stretches back more than 100+ years. Today, it is the only remaining major seaside amusement park on the West Coast. Over the years it has transformed itself, but in current state it attracts eclectic crowds – tourists and locals alike – and has a little something for everyone. For me, the Boardwalk is reminiscent of the carnivals I used to go to as a kid – but on steroids and without the creepy carnies. There are the classic rides that I adored as a youngin – like the Haunted Mansion and Pirate Ship – but then there are entertainment complexes that offer laser tag, arcade games and mini golf that take it beyond just the typical carnival. There are also the kitschy tourist shops that offer the same little trinkets, and for some reason I still felt the need to go into them all. 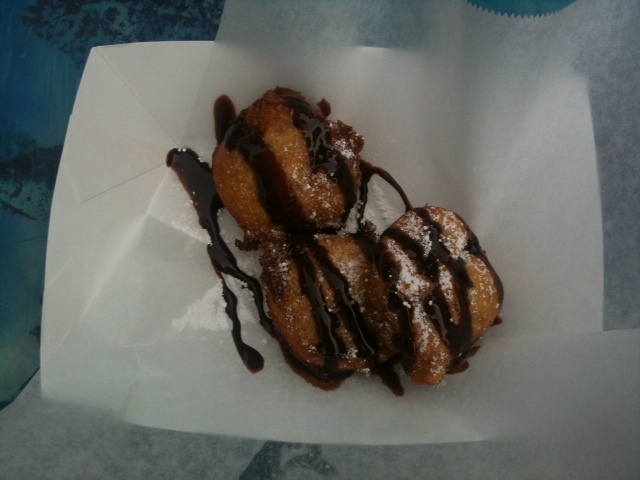 The main event of any carnival or amusement park is the food. No, you are not going to find a James Beard winner here, but what you will get is all the fair food you could want at your disposal. 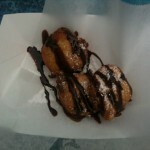 If it is loaded with sugar they have it – à la snow cones, cotton candy, funnel cakes and saltwater taffy. Looking for something fried? (I usually am.) Of course they have corndogs and chicken tenders, but the moment this place won my heart was when I found the stand that served fried Oreos, Twinkies and peanut butter sandwiches. Gluttonous? Yes, but totally worth it. 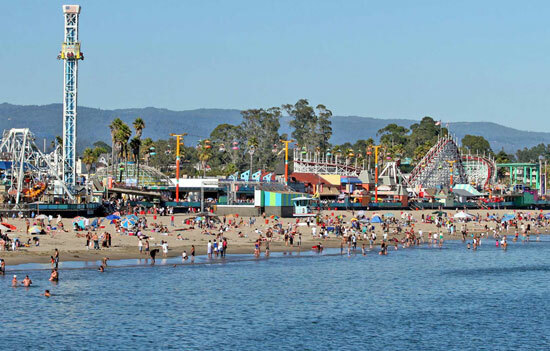 The Santa Cruz Beach Boardwalk can be summed up in one word – excessive. It is completely over-the-top in every way, but somehow it works. It takes you back to the youthful grandeur of when problems were few and fun was plentiful. And it is the perfect way to spend a summer day. Boardwalk rides are open daily Memorial Day to Labor Day and most weekends and holidays throughout the year. Arcades and miniature golf are open daily throughout the year. Admission to the park is free; season passes, all day passes, single ride tickets, group rates, exclusive ride rentals, and corporate events are available.